At-home LED Whitening Kits are an excellent way to help people make their teeth look whiter. These low cost LED systems use a technology that you used to have to visit a dentist to get, but you can now do the treatments in the comfort of your own home. 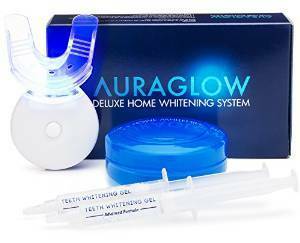 Home teeth whitening systems use a small device with a LED that you use in combination with a hydrogen peroxide-based serum. The light helps to accelerate the whitening solution, without causing the painful sensitivity that goes along with some other types of at-home whitening solutions. There are a lot of different products to choose from; the following are generally the best reviewed and the most popular. The extremely popular AuraGlow kit comes with a LED light that has five bulbs to give it more power. It also has a built-in timer with a beeper, which helps time your treatment sessions. It comes with two syringes with enough gel for 20 or more treatments. The gel has 35% carbamide peroxide, which means it shouldn’t be too strong for most users. The mouth tray that it comes with is reportedly one-size-fits-all, making it suitable for all different types of mouth sizes, letting users whiten both top and bottom teeth at the same time. 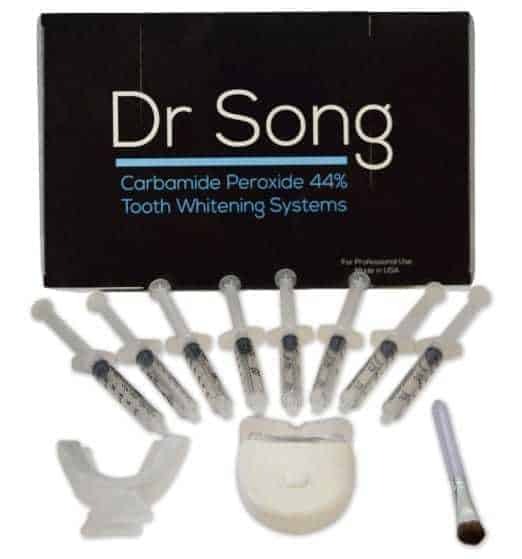 This Dr. Song system is one of the most popular options available. It is a reasonable price for what you are getting, and it also comes with a 100-day money back guarantee, which gives you enough time to see if it is the right system for you. The company does seem to honor the money back guarantee, and users report the customer service to be very responsive. This kit comes with eight large syringes and enough gel for 50 applications. You also get the applicator brush, LED Blue Light Accelerator, and teeth tray. The gel applicator is 44% Carbamide Peroxide, which is a very high concentration for an at-home product. If you have sensitivity, this probably isn’t the right option for you. 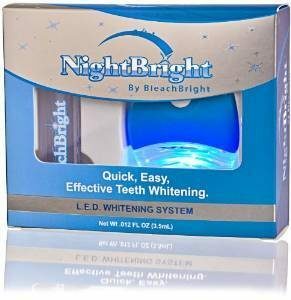 NightBright is a favorite, well-reviewed, and inexpensive LED Whitening System that can give you 2-8 shades whiter teeth. Most users see results after using NightBright for about seven sessions. The effects from this system can last from around 6 to 12 months, and it comes with 30 applications that will last you about ten sessions. This GLO system is one of the more expensive systems around. It uses patent-pending technology that can help users get professional, clinically proven, long-lasting results. It works a little faster than some of the cheaper systems because you have to do four daily sessions of 8 minutes each, which may not work for everyone’s schedules. With this system, you can get up to an eight shade change of whiter teeth, with an average of five shades in five days. Being able to see a noticeable difference in five days is pretty fast, making GLO an excellent option for anyone looking for a quick fix. This system is also good for those who are sensitive to other products, as it uses something called a G-Vial delivery system that applies a unique hydrogen peroxide whitening gel that adheres directly to teeth without ending up on gums and other soft tissue. The GLO whitening gel also doesn’t contain alcohol, which is a cause of sensitivity for some individuals. 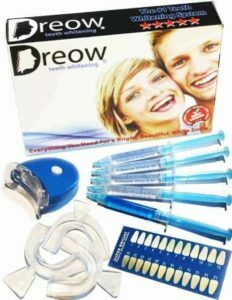 This system from Dreow is an inexpensive option to help get stains off your teeth in a few treatment sessions. It comes with a 365-day satisfaction guarantee, so if you find it isn’t working for you, you can get your money back. 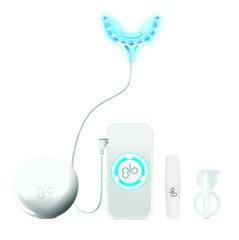 With this kit you get the LED mouth light, that should help accelerate the whitening gel. You also get the trays that you apply the gel to and four syringes of 22% carbamide peroxide gel, which is a good percentage if you have sensitive teeth. You should be able to get around three weeks’ worth of treatment out of this kit. 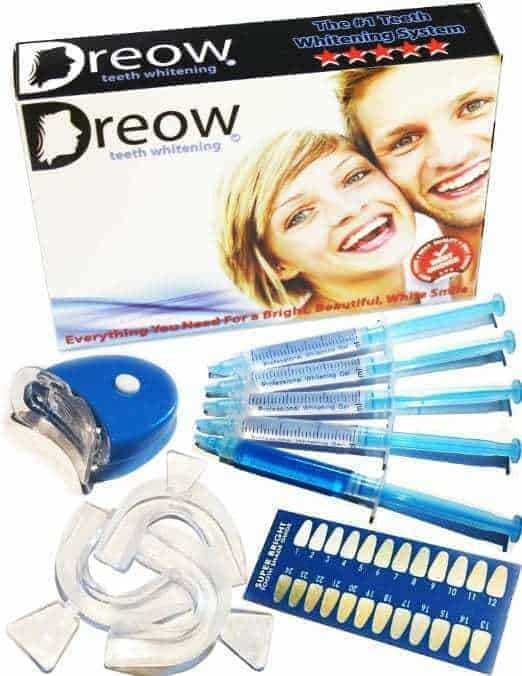 If you are interested in this kit and have a high sensitivity tolerance, Dreow also sells a higher strength 44% carbamide peroxide system called Dreow Max Strength Teeth Whitening Kit. Having stained teeth can make anyone feel self-conscious; luckily there are many different options to help you get a whiter smile. Advances in technology have improved to make LED whitening systems one of the best options around. Not only are they inexpensive compared to professional treatments, but they are also easy to use, and most users find that they work very effectively with relatively little inconvenience. They will not make your teeth as white as what you get from professional treatments as quickly, but a lot of users have been pleased with the type of results that they are getting from these type of kits without all of the cost and hassle of getting to professional treatment appointments. Generally, when you buy an LED tooth whitening system, you will get the LED light that will be used to accelerate the whitening gel, a tooth tray that you will put the solution into and then place the tray onto your teeth. Most of the gels contain carbamide peroxide with varying concentrations. (22% is a good concentration for those with sensitive gums, while users with very stained enamel or who do not have sensitivity issues can go up to around 44%). You begin by applying the whitening gel; then you turn on the LED. When the blue light is shined onto the teeth it activates the gel and creates the whitening effect. The LED are usually a cold blue light of around 465 nanometers, although the lights from different kits have various strengths. Using the light helps the whitening gel or bleaching agent absorb better into the enamel. All of the systems are slightly different, but it does take some time and work to get the best results. Many kits recommend up to twenty minutes per treatment, with some having users do two treatments of 15 minutes each. When deciding on the best treatment for you, you will have to think about how sensitive your teeth are, and how stained your enamel is. If you have sensitivity issues, you will want to look for a product that has a lower concentration of carbamide or hydrogen peroxide. If you have very stained teeth, you may need more treatments than an average user. LED whitening kits are safe to use, although with a few caveats. Before using any of these systems, you should consult with your dentist to make sure you do not have any untreated cavities or gum disease. The kits use LED technology, which is also known as cool blue technology, and there is no heat emitted. It means that, for the most part, the systems are safe to use with most dental work (although read all instructions and cautions of any product you are thinking of using before use). If you have very sensitive teeth, there is some chance you may experience pain if you get the gel on your gums. Hydrogen peroxide can irritate the gums and any areas of the teeth that don’t have a thick enough layer of enamel. You should only apply the gel to the teeth and not the gum. You should also avoid putting the whitening gel on any areas that are already sensitive. Most users have no pain or discomfort when using these types of kits. Do not let children under the age of 12 use an at-home lightening system. Does LED Teeth Whitening Work? Yes, at LED home whitening does work, but the concentration of at-home products contain a much lower level of carbamide or hydrogen peroxide than what you would get from a professional-level whitening treatment. Because of this, professional treatment work much faster than at home treatment, but they also come with a much higher price tag. The other thing that you have to consider is the results you get depend on a lot of different factors, including whether the gel is carbamide or hydrogen peroxide, the concentration of the gel, how discolored the teeth are, and how well your enamel reacts to the gel. How long does LED whitening last? Whitening results can last for many months after treatment, as long as the teeth are well maintained once the procedure is complete. If you don’t smoke, drink coffee, drink tea or red wine and are seeing your dentist regularly, the effects of some of the at-home whitening kits can last up to two years. Although with the at-home treatment you may have to do some maintenance treatments. If you are looking for an inexpensive, easy to use way to improve the look of your teeth, LED whitening systems are a great option. They let you avoid the cost and inconvenience of having to get professional treatments, and you can customize the treatments depending on the level of whitening that you need. There are products available for a wide range of budgets that have various peroxide solution concentrations for users with different levels of sensitivity. If you have found other whitening systems too painful, an LED system may work well for you. Once you have gotten the right kit, you will be happy to show off your pearly whites for everyone to enjoy.